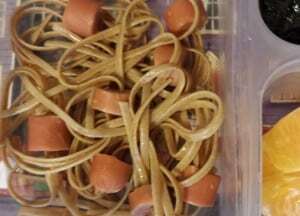 Home»Cooking, Cleaning and More»Adventures in Cooking»"I Love School" Lunch Boxes»How to make spaghetti squids with pasta and hotdogs! Part of the “I Love School” Lunch Box series. How to make spaghetti squids with pasta and hotdogs! Part of the “I Love School” Lunch Box series. Every school day I make my kids a fun lunch. It started a couple of years ago as a bribe to get my son to stay at preschool. I’ve never heard my kids exclaim, “I Love School!”, after seeing my lunch creations, but the lunches do motivate them to get in the car and to school before the tardy bell. And this is just fine for me! Our favorite lunches are usually rice balls. I made a few this week, but the new and unusual lunch was the squid lunch! 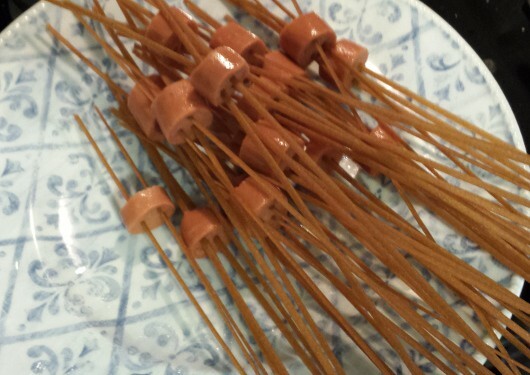 To make the squids, I took dry linguine and poked it through sliced veggie dogs. Spaghetti noodles and real hot dogs would work as well. I then dropped my little squids into boiling water and had lunch almost ready 10 minutes later. Once the water was drained, I added a little olive oil to keep them from sticking and packed them up for lunch. My kids thought this was a clever little lunch, but did have some concerns over eating squids. I am currently looking for new name suggestions because squids are just too scary for a lunch box! Until I have a new name, I’m off to search Pintrest for even more ideas! Ice Skating to Return to Discovery Green on November 22, 2013! Things to do this winter in Houston!